The ADRC participated in the "Orientation Training on the Use of DRR Project Portal" developed under the IAP initiative on Regional Stocktaking and Mapping of DRR interventions, held in Bangkok, Thailand on 17-18 June 2010. The training was organized by the Asian Disaster Preparedness Center (ADPC) in partnership with UNISDR and with support from the Asian Development Bank (ADB). 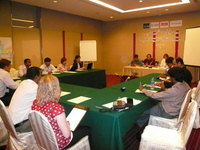 Approximately 30 officers from IAP members and other organizations in Asia and the Pacific joined the training. In the training, participants learnt about the DRR Project Portal, including its usage, and also discussed on possible ways to increase the use of the DRR Project Portal and challenges in updating information. This portal is expected to contribute to promoting coordination and collaboration among DRR practitioners in Asia and the Pacific, avoiding duplications of activities, and better planning and programming in Asia and the Pacific. The ADRC would like to provide support to the portal and contribute to further promoting it among DRR practitioners in Asia and the Pacific.